While the Jeep JK Wrangler is without a doubt, the best off road vehicle ever made, the headlights it comes with from the factory are anything but. In fact, I’d have to say that they are the one thing that everyone I know who owns a JK, hates about it. The light they provide are a sickly yellow at best, are really only focused at one point and do very little to fill in the road immediately in front of you. In fact, it is for that reason this that most people who own a JK tend to always use their fog lights in conjunction to their headlights and, are always in search of a good replacement. In 2012, Chrysler decided to switch out the standard Group 34 battery they had been using since 2007 and replaced it with a Group 91. For the most part, this would be no big deal as they are pretty much the same thing but, there is one key difference that makes it difficult to use a Group 34 and, that is the terminals are on opposite sides. Because the power and ground leads are cut to such an exact length, you can’t simply cross them over and call it a day. Of course, to complicate things even more, a Group 91 battery isn’t really a common size and certainly not one you can find easily in a deep cycle format or, at least not until now. Having a good CB Radio in your Jeep JK Wrangler is not only a lot of fun, it’s an important piece of equipment that a lot of clubs and organized trail events require you have. Unfortunately, one of the biggest reasons why so many are reluctant to install a good CB Radio is because most are pretty big and bluky and really, there are so few places if any, to install one and cleanly. So, for some reason, Jeep decided to change the type of battery they use in the Jeep JK Wrangler from a Group 34, which was used in 2007-11, to a Group 91 which is now used in all 2012’s and I presume, on up. While this really shouldn’t be that big of a deal, the terminals on a Group 91 battery are opposite to those on a Group 34 and, this makes it near impossible to hook up the leads or, at least not without having to do some modifications. Of course, as luck would have it, a Group 91 battery or it’s equivalent, a Group 48, isn’t really a common size you find in a deep cycle format and unfortunately, not something that’s available in a Sears Diehard Platinum, Odyssey or even Optima. Although we don’t always plan our wheeling trips to go late into the night, there are plenty of times when they do and if there’s one thing I think we all wish we had, it’s a bit more light to help guide us down the long dusty trail. Needless to say, that’s why I picked up a pair of IPF 900XS lights. As much as I absolutely love my Jeep JK Wrangler, I have to say that there’s one thing that has always bugged me and for whatever it’s worth, it’s something that bugs pretty much everyone else I know who owns a JK too. In a word, the factory headlights are simply TERRIBLE. While they appear to be very shiney, the actual beam they put out is very yellow and narrow and more times than not, I feel as though they aren’t even on. In fact, most people I know insist that they have to run their fog lights at night in order for them to see where they’re going. While a decent FRS walkie-talkie style hand held radio will get you by on the trail, there really is nothing that compares to a good old fashion CB radio when it comes to range, audio clarity, reliability and ease of use. And, it’s for those reasons that’s so many Jeep clubs make having a CB Radio a requirement in order to go on their runs. Now, I know there are a lot of people who try to argue that a CB radio is too expensive or that they wouldn’t know where to install one in the Jeep JK Wrangler and it is for them that I have created this easy to follow write-up. 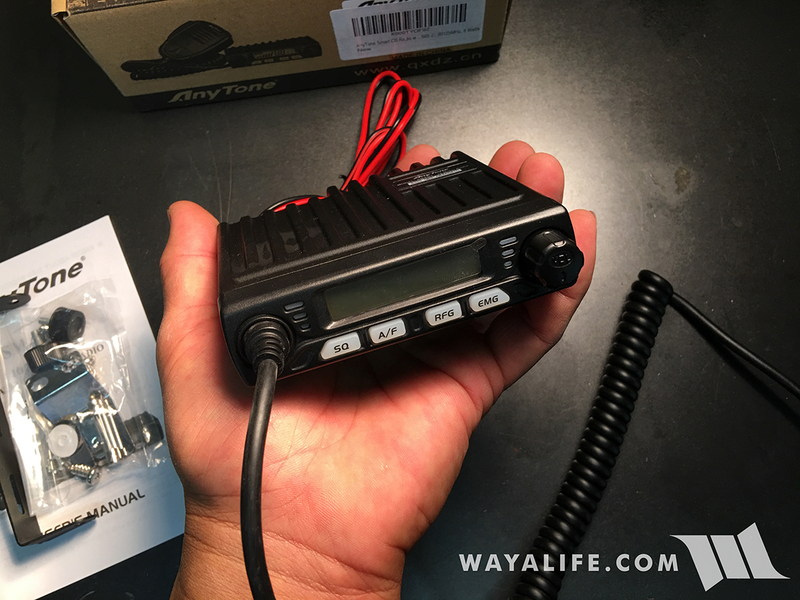 With the very affordable Midland 1001Z CB Radio (can be purchased for about $32 shipped), a few simple tools and an hour of your time, you can have a great CB radio installed on your Jeep that’s compact, looks great and comes loaded with features including a PA switch. Need I say, you no longer have any excuses for not having a CB radio in your Jeep.